Despite an onslaught from the establishment media and rebukes from President Trump, Attorney General Jeff Sessions has delivered on the central issue of his political career: Creating an immigration policy which serves Americans. Sessions has been the leading official implementing Trump’s “Hire American” policy even as other appointees failed at the task. On July 25, Rep. Kevin Yoder (R-KS) was leading a House homeland-defense appropriations committee. Yoder had just met with Trump the day before on Air Force One which was headed for a Kansas rally. The Kansas congressman took charge in the committee meeting to ram through a series of open borders policies, ones that were not only staunchly against Trump’s reform efforts on immigration, but also at odds with Sessions’ asylum reforms that were implemented despite efforts inside the Department of Justice (DOJ) to block the initiative. Yoder’s series of open borders plans — which he would try to slip into the Department of Homeland Security’s (DHS) funding bill — included opening asylum for nearly the entire population of Central American, a green-card amendment that opened the door to more outsourcing of college-graduate jobs, amendments to expand the blue-collar H-2A and H-2B visa-worker programs, and an amendment to block detention of migrant families. Ahead of the plans’ passing in the House Homeland Security committee, Sessions got word of Yoder’s effort and called him. Behind the scenes, Sessions attempted to convince Yoder that his plans would defeat the pro-American immigration reform agenda of the administration. Despite Sessions’ warning call, Yoder and the Republicans voted to move forward with the plans. This single case of Sessions’ quiet efforts to keep a steady hand on the president’s “America First” immigration agenda came even though the White House was unaware of Yoder’s plans. Seeing stalemate in the Republican-controlled Congress on immigration, Sessions took the lead on the issue, enacting asylum reforms and deploying more immigration judges to the U.S.-Mexico border. Perhaps Sessions’ greatest immigration fight for American workers came when he announced in September 2017 the ending of Obama’s Deferred Action for Childhood Arrivals (DACA) program which had given executive amnesty to more than a million illegal aliens. Though Sessions successfully fought for the precise agenda that the president campaigned on, he was relentlessly attacked by Trump and scolded by beltway conservative pundits on Fox News for what they saw as an unwillingness to fight on behalf of the attorney general’s part. Much like his fighting on behalf of American workers in the Senate, Sessions targeted a number of businesses in high-profile cases that he found had hired foreign workers over U.S. citizens, a violation of the country’s discrimination laws. In many cases, Sessions Civil Rights Division’s “Protecting U.S. Workers Initiative” fined and punished businesses that had skipped over Americans to instead hire their cheap, foreign labor counterparts. When a caravan of migrants was headed to the U.S.-Mexico border, less than six months ago, Sessions took matters into his own hands by building a legal wall against the migration by instructing prosecutors and immigration judges to take action to block false asylum claims. At the same time, the White House and GOP Congress failed to meet any sort of immigration agreement to build a border wall to block future caravans. Though Trump promised to end sanctuary cities, his Republican Congress has yet to pass such a plan. Sessions, seeing the gridlock, once again took on the effort, announcing in March that his DOJ would sue the state of California for their statewide sanctuary city law that protects criminal illegal aliens from deportation. 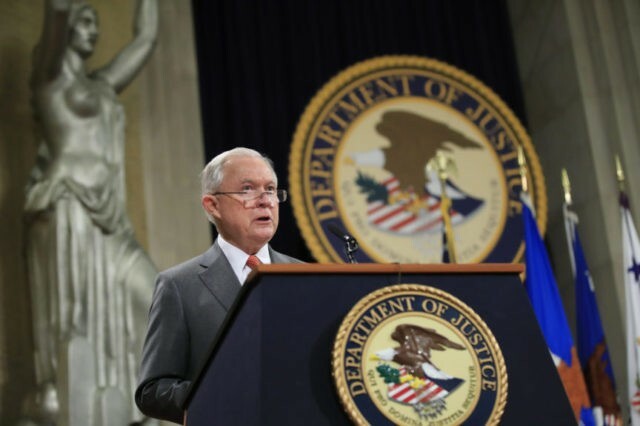 “We believe that we cannot accept the kind of restrictions that California placed on federal law officers, and we believe that their actions exceeded the Constitution, and we will win in the courts eventually,” Sessions told Breitbart News. Sessions has been accused of being absent from the job, but the record will show that his role as attorney general has been central to the formation of an immigration policy which serves the American people and their interests.